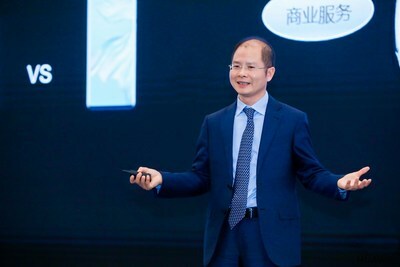 SHANGHAI, April 17, 2019 /PRNewswire/ -- At the 2019 International Auto Key Tech Forum, Huawei Rotating Chairman Eric Xu delivered a keynote speech: Embrace the Convergence of Automotive & ICT Industries. The automotive industry is increasingly turning to information and communication technology (ICT) as a new key technology. Xu noted, "Together with the deep convergence of automotive and ICT, the intelligent connected electric vehicle emerges as a new revolutionary development engine of human society, with its impact going far beyond the two industries themselves." In the face of evolutionary changes, Huawei has made its strategic choice. "Huawei does not make cars," said Xu. "Focusing on ICT, Huawei aims to enable car OEMs to build better vehicles." He stressed, "Based on ICT, Huawei aims to be a digital car oriented and new-added components provider."